Our search for Hong Kong’s best noodles, let us to Lau Sum Kee’s Noodles (劉森記麵家).These noodles are made in the traditional bamboo or jook-sing (竹昇) method which involves using a bamboo roller to press the eggs, flour and other ingredients together. According to Wiki (my source of all knowledge), it’s considered one of the most rare type of noodle in existence. Making the noodles using this method apparently gives the noodles more bounce, more QQ. Today in Hong Kong, there are very few places that continue to make noodles this way. 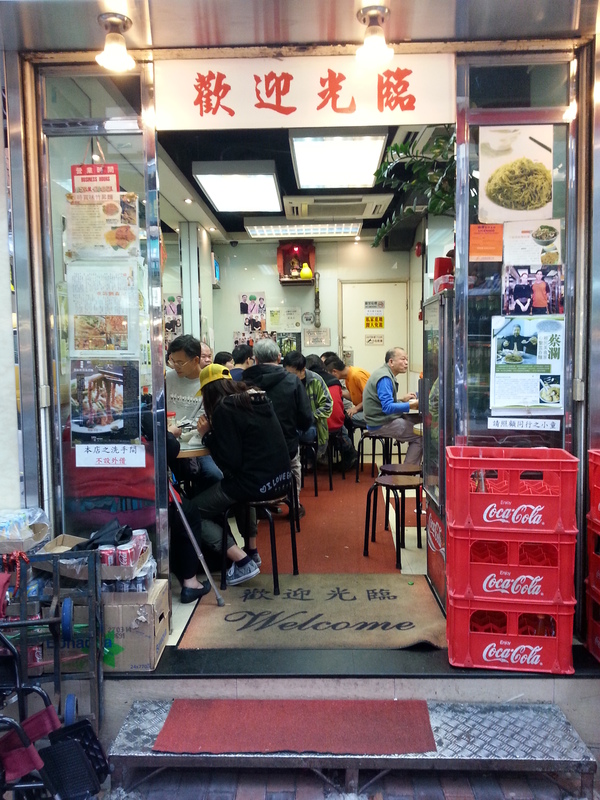 Lau Sum Kee in Sham Sui Po is one establishment that does. 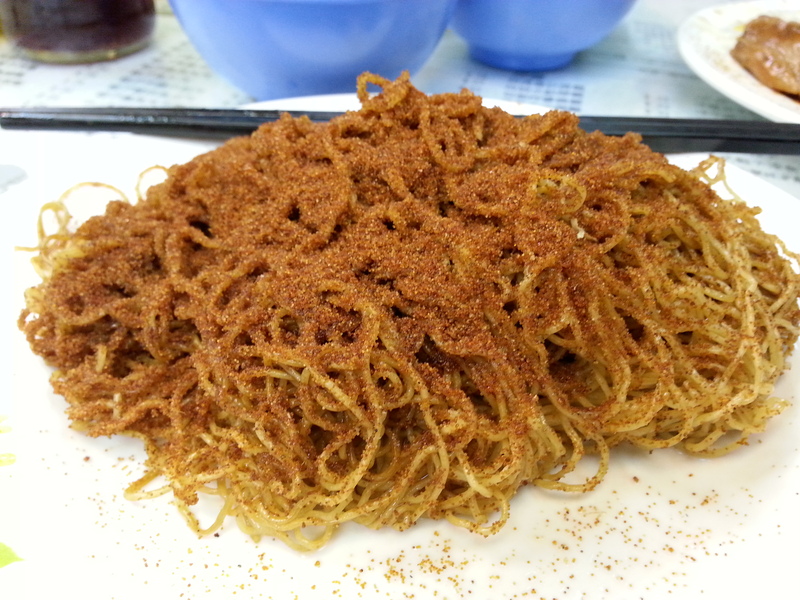 Lau Sum Kee also specialises in serving their noodles dry tossed in shrimp fish roe or har ji lo mien (蝦子撈麵). Sam ordered his noodles with a side of wonton whereas I ordered mine with a side of beef brisket. Essentially you can order your noodles with anything you want from the menu from pork knuckle to tripe. The star of the show really is the dry shrimp roe bamboo noodles. The noodles have an incredible bouncy texture that is both bouncy/firm yet soft to bite. The shrimp roe tossed through the noodles is plentiful and gives the noodles an extra dimension of crunch and saltiness. Despite the fame, this truly is a no frills establishment. There is no English menu and be prepared to share tables. 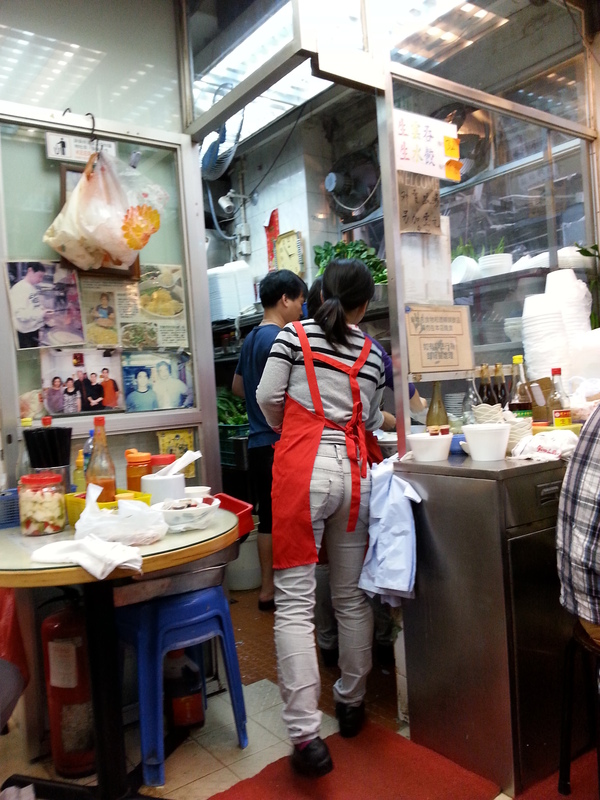 The kitchen is tiny at this establishment with just one noodle master, cooking and tossing the noodles in the shrimp roe mixture. The consistency of the noodles is truly incredible. Even without the shrimp roe (there were many regulars that came in and had noodles without the har ji) it would be worth a journey back. This entry was posted in Hong Kong, Hong Kong restaurants and tagged Bamboo, egg noodles, hong kong, Noodle, street food. Bookmark the permalink.